﻿ Kruhy v obilí. Crop Circles. Basic research and understanding. One of the greaest jokes of Mother Nature. Created by Lightning, but arise many days after. Exactly at the moment of the lightning discharge flow through corn stalks induced and conducted (by ionized air) electric currents. Thanks to that stalks and other plant parts may exhibit electromagnetic properties. They may thus act like magnetized compass needles, and the electromagnetic forces are momentarily deflecting them to the ground in a clockwise or counterclockwise direction, depending on the direction of the passaging electric currents. 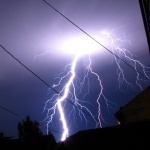 Magnetic fields of an average lightning discharges are at least ten thousand times stronger than that of Earth's magnetic field. Another part of the work may be performed by enormous electrostatic forces thanks to that leaves and stalks of plants behave like leaves and stalks of electroscopes. 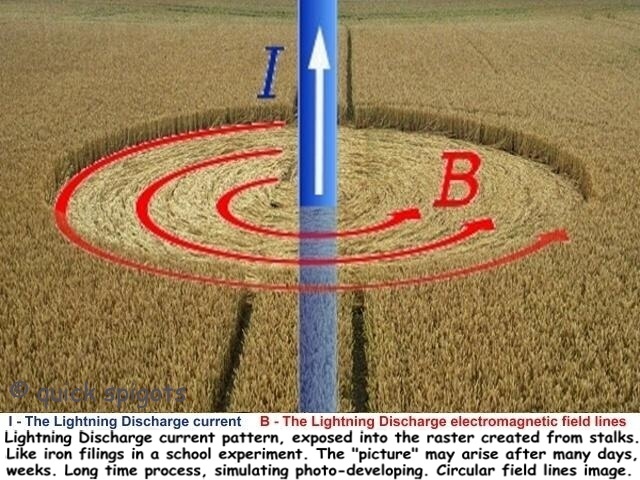 Diameters of the circles represent the range of the lightning discharge electromagnetic effects.